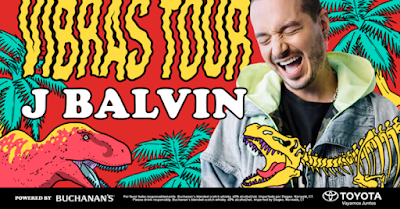 Multi-platinum, award-winning Colombian superstar and one of the hottest acts in Latin music J Balvin is inviting North American fans to vibe with him this fall on his newly revealed Vibras Tour Powered by Buchanan’s Whisky. The news comes on the heels of the recent announcement that his highly-anticipated new album VIBRAS will be released May 25, and is available for presale now. The 27-date tour produced by Live Nation kicks off September 19 in Fresno, California and will make stops in Los Angeles, New York, Miami, Chicago, Las Vegas, Houston and more. The outing will wrap on October 28 in Miami, Florida Citi® is the official presale credit card of the "Vibras Tour Powered by Buchanan’s Whisky" As such, Citi cardmembers will have access to purchase presale tickets beginning April 24 at 10 a.m. local time, until April 26 at 10 p.m. local time through Citi’s Private Pass® program. For complete presale details visit citiprivatepass.com. Tickets will go on sale to the general public beginning April 27 at 10 a.m. local time at LiveNation.com. 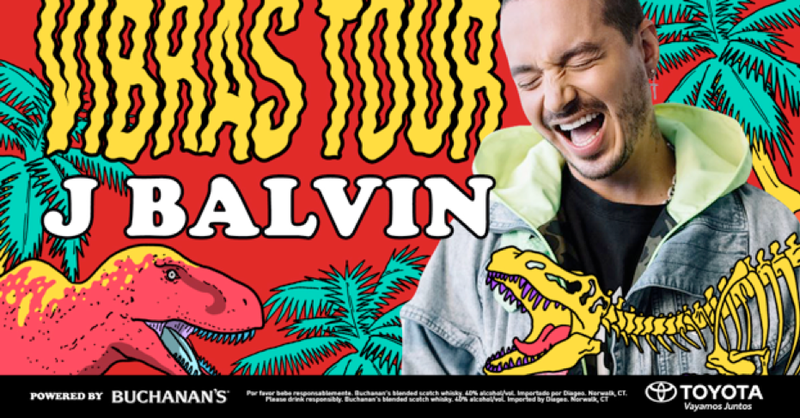 As one of the music world’s most in-demand collaborators, Balvin has hit songs with Beyoncé, Cardi B, Justin Bieber, Pharrell Williams, Camila Cabello, Nicky Jam, Bad Bunny, Liam Payne and many more - making the Vibras Tour Powered by Buchanan’s Whisky a can’t miss event for fans ready to hear all of their favorite songs live. Buchanan’s Whisky continues to be a proud supporter of Latin music through their ongoing partnership with J Balvin for the brand’s Es Nuestro Momento (It’s Our Time) campaign, which celebrates the positive influence Latinos have on mass culture. Building off the success of the Energía tour, Buchanan’s Whisky is thrilled to be joining J Balvin on the road for the second consecutive year to toast the greatness of the Latin community. Joining as the official and exclusive automotive sponsor of the tour, Toyota is proud to partner with J Balvin for the second time in his impressive journey. After his first successful U.S. tour, “Mi Familia”, Toyota continues to celebrate J Balvin’s rise to stardom and looks to connect music lovers and fans with this sensational tour through a combination of onsite and social elements that give them a front row seat to all the musical vibes. BUCHANAN’S Blended Scotch Whisky is the ultimate choice for those who are working hard to follow their dreams and who enjoy sharing their success with others. The BUCHANAN’S brand has more than 130 years of authentic heritage, and every bottle represents James Buchanan’s commitment to creating the finest blended Scotch Whiskies. The Buchanan’s Portfolio features four award-winning marques, including BUCHANAN’S 12 Year Old DeLuxe, BUCHANAN’S Master, BUCHANAN’S 18 Year Old Special Reserve and BUCHANAN’S Red Seal. All of these marques have been recognized in the most prestigious international spirits competitions. BUCHANAN’S launched a fully integrated campaign called Es Nuestro Momento, which represents the celebration of Hispanic culture and recognition of the continued achievements of the Hispanic community. 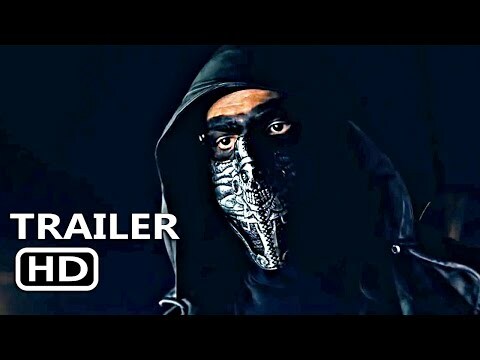 The campaign features global Latin music superstar J Balvin. For more information, visit BuchanansWhisky.com or connect with us on Facebook: facebook.com/BuchanansUS, Instagram:instagram.com/BuchanansWhisky, and Twitter: @BuchanansUSA. Toyota partners with community, civic, academic, and governmental organizations to address our society’s most pressing mobility challenges. We share company resources and extensive know-how to support non-profits to help expand their ability to assist more people move more places. For more information about Toyota, visit toyotanewsroom.com.